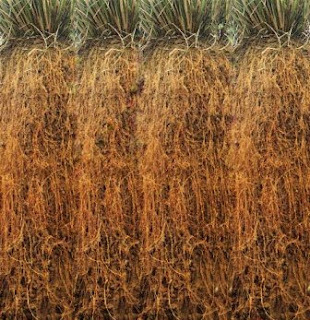 A 'wall' of vetiver roots underground. Magic grass, silver bullet, wonder grass, miracle grass – these are all adjectives that other people have ascribed to Vetiver grass.Every user has different expectations of this grass. Most often these expectations are achieved in very significant and positive ways – hence the accolades. We don’t often hear of failure – undoubtedly there are failures, but most times they are insignificant compared to the successes; and when there is failure it is not the fault of the plant but most often that of the person who planted it.Although there may be other biological solutions that may be better than the vetiver solution in dealing with a specific problem and condition, they remain few and far between. The uniqueness of The Vetiver System is first its wide range of application under very varying conditions, and secondly its wide range of problem mitigation use. Thus, the basic Vetiver System comprising of a Vetiver grass hedgerow is a technology that has far wider application than any other single biological alternative.This breadth of application feature should give the Vetiver System a distinct advantage especially as the technology is low cost, relatively simple to use, and most times effective. It is not difficult to train people in Vetiver grass propagation and application.Diti Henchaovanich of Thailand did not give Vetiver the name of “soil nail” just for the heck of it – rather he saw the long-term function of Vetiver as an indispensable living “nail” to hold soil together, just as a carpenter needs wire nails as an essential construction item. I call it nature’s “band aid”Some years ago I visited Honduras, and I noticed that nearly every rural household had a clump of Vetiver in their back yard for medicinal purposes. In the future, every household in tropicalcountries should have Vetiver in their back yard to be used as needed as a tool or measure for home and farm land repair and protection and for waste water treatment. Every community (in the broadest sense) should have access to its own or other supply source (preferably private sector) of Vetiver grass to mitigate local land and water needs that fall under community jurisdiction. Whenever there is a problem concerning land and water, Vetiver grass should be the “default” technology that users turn to. Only after rejection for unsuitability should an alternative option be considered.It would not be difficult to get to this stage if government, non-government organizations, development agencies, and private sector policy makers and administrators at various levels were to take appropriate action. I believe that, if this approach were to be taken, there would be a chance of making significant gain in improving the quality of land and water resources across the board through community driven micro programs and private sector actions.